Ocean King 2 : Monster's Revenge PCB Upgrade Kit is suited to customers wanting to update or recondition their original Ocean King or video redemption fish hunting cabinet. Update your old fish gaming machine or Ocean King cabinet to the best available game currently in the market - the Ocean King 2! This PCB kit accommodates cabinets for 6 or 8 players (changeable via the gameboard) and comes with everything you need to get the most action-packed video redemption fish game and breathe new life into your location! 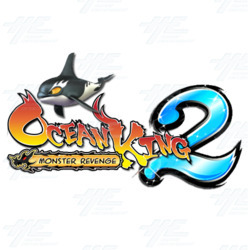 In Ocean King 2, players are taking on horrible sea monsters seeking revenge for the fallen fish of Ocean King. The controls for the game are the same allowing for a smooth transition between games (aim with joystick, fire weapons with 'SHOOT' button, and change guns with 'WEAPON' change button). However, the game itself is packed full of new characters, features and mini games, offering more content than ever before. New characters include Fire Dragon and Electromagnetic Cannon Crab, and there is also a new feature of the game which has giant versions of low profit fish, such as Clown Fish, Butterfly Fish and Fugu. These fish are much harder to kill than their smaller counterparts and are worth more points! The game also includes 16 returning characters from the original, including a revised version of Bomb Crab, Fugu, Flounder, Snapper, Devilfish, Clown Fish, Butterfly Fish, Lion Fish, Lantern Fish, Sea Turtle, Lobster, Saw Shark, Octopus, Shark, Overlord Humpback Whale, and the Killer Whale! To help the players to catch the fish, they have several regular weapons which players can switch between at any stage of the game including Fish Net, Gun Tube, and Lock gun; however, they also have a new arsenal of powerful weapons too, which appear at random, including: - Flamestrike De-Buff - this feature appears at random. Players must shoot the weapon in the specified time and they will be eligible to get Double Score or Extension of Shooting time, making this a key weapon for achieving high scores. - Drill Cannon - ricochets from one side of the screen to the next, damaging and/or killing everything in it's path. Once it has travelled as much as it can, it explodes taking even more fish. - Chain Explosion Crab - previously known as Bomb Crab. This revised character weapon doesn't just explode once like in the original, it explodes a whopping 3 times, moving around the screen with each explosion! This is capable of killing all fish in range with a maximum of x10 credits! These weapons also come in handy against the super tough BOSS characters, a new game feature to the Ocean King line up. These BOSS characters include: - The Prehistoric Giant Crocodile - he will attack players as he swims by, damaging their weapons. - The Night Monster - who makes the screen go dark, and it becomes very hard to see any of the other fish to score points. - Overlord Crab - all hail! This king of crabs can be taken out either by damaging his pincers or killing him directly. - Deep Sea Octopus - this monster is too huge to fit on the screen, players must attack his tentacles to defeat him! While the game has kept some of the mini games from the original, such as Chain Lightning, Electromagnetic Crab, and Overlord Whale, it has also added a never-before seen mini-game called Battle in the Golden City, which is free to enter. The game appears randomly and players must catch the fish within the time limit. Score potential is unlimited and players can get rewards, such as Double Treasure Chests! There are also operator adjustable features which allow the game to be customized to meet the needs of your location and players, including Payout function, background music, sound effects, shooting time limit, odds and chance levels, plus many more! There are also new stages to be enjoyed, brought to life by the HD 3D graphics and, with plenty to look at and constant action, this game is thrilling for both players and onlookers. Ocean King 2 : Monster's Revenge PCB Upgrade Kit is great for operators looking to boost their revenue or update their old fish machines. It's suitable for a wide range of locations and appeals to players of all skill levels! Update your old fish gaming machine or Ocean King cabinet to the best available game currently in the market - the Ocean King 2! This PCB kit accommodates cabinets for 6 or 8 players (changeable via the gameboard) and comes with everything you need to get the most action-packed video redemption fish game and breathe new life into your location! In Ocean King 2, players are taking on horrible sea monsters seeking revenge for the fallen fish of Ocean King. The controls for the game are the same allowing for a smooth transition between games (aim with joystick, fire weapons with 'SHOOT' button, and change guns with 'WEAPON' change button). However, the game itself is packed full of new characters, features and mini games, offering more content than ever before. New characters include Fire Dragon and Electromagnetic Cannon Crab, and there is also a new feature of the game which has giant versions of low profit fish, such as Clown Fish, Butterfly Fish and Fugu. These fish are much harder to kill than their smaller counterparts and are worth more points! The game also includes 16 returning characters from the original, including a revised version of Bomb Crab, Fugu, Flounder, Snapper, Devilfish, Clown Fish, Butterfly Fish, Lion Fish, Lantern Fish, Sea Turtle, Lobster, Saw Shark, Octopus, Shark, Overlord Humpback Whale, and the Killer Whale! While the game has kept some of the mini games from the original, such as Chain Lightning, Electromagnetic Crab, and Overlord Whale, it has also added a never-before seen mini-game called Battle in the Golden City, which is free to enter. The game appears randomly and players must catch the fish within the time limit. Score potential is unlimited and players can get rewards, such as Double Treasure Chests! There are also operator adjustable features which allow the game to be customized to meet the needs of your location and players, including Payout function, background music, sound effects, shooting time limit, odds and chance levels, plus many more! There are also new stages to be enjoyed, brought to life by the HD 3D graphics and, with plenty to look at and constant action, this game is thrilling for both players and onlookers. Ocean King 2 : Monster's Revenge PCB Upgrade Kit is great for operators looking to boost their revenue or update their old fish machines. It's suitable for a wide range of locations and appeals to players of all skill levels!